Sometimes people find it difficult to read temperature from analog thermometer because of fluctuations. So here we are going to build a simple Digital thermometer using 8051 microcontroller in which LM35 sensor is used for measuring the temperature. This project will also serve as a proper interfacing of ADC0804 with 8051 and 16*2 LCD with 8051 microcontroller. 8051 microcontroller is a 8 bit microcontroller which has 128 bytes of on chip RAM , 4K bytes of on chip ROM, two timers, one serial port and four 8bit ports. 8052 microcontroller is an extension of microcontroller. The table below shows the comparison of 8051 family members. The ADC0804 IC is an 8-bit parallel ADC in the family of the ADC0800 series from National Semiconductor. It works with +5 volts and has a resolution of 8bits. The step size and Vin range varies for different values of Vref/2. The table below shows the relation between Vref/2 and Vin range. In our case Vref/2 is connected to 1.28 volts, so step size is 10mV. For ADC0804 step size is calculated as (2 * Vref / 2) / 256. Where Dout is digital data output in decimal, Vin = analog input voltage and step size (resolution) is the smallest change. Learn more about ADC0804 here, also check interfacing of ADC0808 with 8051. The LM35 is a temperature sensor whose output voltage is linearly proportional to Celsius temperature. The LM35 comes already calibrated hence requires no external calibration. It outputs 10mV for each degree of Celsius temperature. LM35 sensor produces voltage corresponding to temperature. This voltage is converted to digital (0 to 256) by ADC0804 and it is fed to 8051 microcontroller. 8051 microcontroller converts this digital value into temperature in degree Celsius. Then this temperature is converted into ascii form which is suitable for displaying. This ascii values are fed to 16*2 lcd which displays the temperature on its screen. This process is repeated after specified interval. The complete C program for this 8051 Thermometer Project is given at the end of this project. The code is split into small meaningful chunks and explained below. For 16*2 LCD interfacing with 8051 microcontroller , we have to define pins on which 16*2 lcd is connected to 8051 microcontroller. RS pin of 16*2 lcd is connected to P2.7 , RW pin of 16*2 lcd is connected to P2.6 and E pin of 16*2 lcd is connected to P2.5. Data pins are connected to port 0 of 8051 microcontroller. Similarly, for ADC0804 interfacing with 8051 microcontroller, we have to define pins on which ADC0804 is connected to 8051 microcontroller. RD pin of ADC0804 is connected to P3.0, WR pin of ADC0804 is connected to P3.1 and INTR pin of ADC0804 is connected to P3.2. Data pins are connected to port 1 of 8051 microcontroller. Next we have to define some functions which are used in the program. Delay function is used to create specified time delay, cmdwrt function is used to send commands to 16*2 lcd display, datawrt function is used to send data to 16*2 lcd display and convert_display function is used to convert the ADC data into temperature and to display it on 16*2 lcd display. In below part of the code, we are sending commands to 16*2 lcd. Commands such as clear display, increment cursor, force the cursor to beginning of 1st line are sent to 16*2 lcd display one by one after some specified time delay. In this part of the code, we are sending data to 16*2 lcd. Data to be displayed on 16*2 lcd display are sent to display one by one after some specified time delay. In this part of the code we are converting the analog voltage produced by LM35 sensor to digital data and then it is converted to temperature and displayed on 16*2 lcd display. For ADC0804 to start the conversion we have to send a low to high pulse on WR pin of ADC0804, then we have to wait for end of conversion. INTR becomes low at the end of conversion. Once INTR becomes low, RD is made low to copy the digital data to port 0 of 8051 microcontroller. After a specified time delay, next cycle starts. This process is repeated forever. In below part of the code , we are sending commands to 16*2 lcd display. The command is copied to port 0 of 8051 microcontroller. RS is made low for command write. RW is made low for write operation. High to low pulse is applied on enable(E) pin to start command write operation. In this part of the code, we are sending data to 16*2 lcd display. The data is copied to port 0 of 8051 microcontroller. RS is made high for command write . RW is made low for write operation. High to low pulse is applied on enable(E) pin to start data write operation. 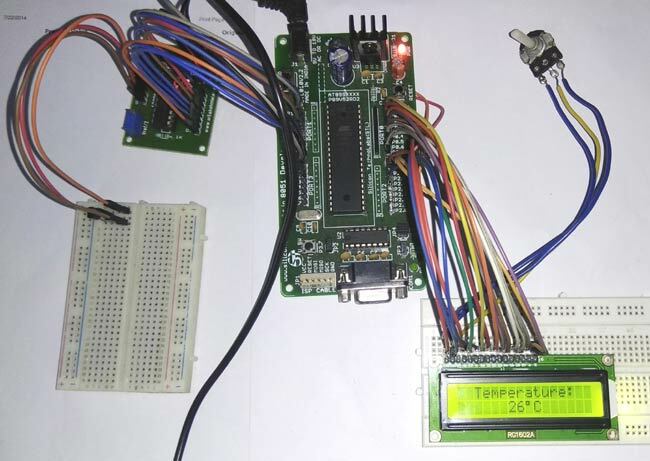 In this part of the code, we are converting digital data into temperature and displaying it on 16*2 lcd display. Really well written and described. Is it possible to use the code for Proteus Simulation? Thanks and more power. what is the problem behind it ? Impressive explanation helps a lot thanks. We have implemented the circuit and code as given, LCD is glowing but nothing is displaying on the LCD. Proteus simulation also gives the same result-glowing LCD but no display of characters. What is the problem? Please help us ASAP as it is required for our academic project. I have executed this circuit design in Proteus and have burnt the keil hex code onto the microcontroller. On running the simulation, there were no such errors found but it is not dusplaying an output on the LCD. What's wrong? Yes read about that, tried all the possibilities, how exactly do I ensure what you're suggesting? Is there some problem in the code? Maybe that's why the display is not showing any readings and just glowing? Can someone please help me, it's urgent.